On Monday school shoes belonging to matric learners at Randfontein High School on the West Rand lay in a long, black line on the school stoep. The learners had written their last exam, and with the exam behind them they said goodbye to their school career – and their school shoes. The school shared a photo of the shoes on its Facebook page and confirmed that they would be given to underprivileged learners. The photo attracted a lot of attention on social media. It was shared more than 18 100 times and more than 25 000 people “liked” it. It wasn’t long before former learners at the school donated brand new shoes to the project. But Randfontein High wasn’t the only school to do this. The learners at Midstream College in Midrand also took off their shoes. Matric learners at Hoërskool Waterkloof in Pretoria also left school bare-foot. Another school whose matrics donated their shoes was Hoërskool Voortrekker in Pietermaritzburg. As far afield as the Northern Cape matrics kicked off their school shoes. Hoerskool Upington donated its matrics’ shoes to the ACVV, a charity. The matric learners of Hoërskool Ben Viljoen in Groblersdal, in Limpopo, also kicked off their shoes. “The matric learners of 2016 took off their shoes after writing their last exam on Monday 28 November 2016, and left them behind at school. 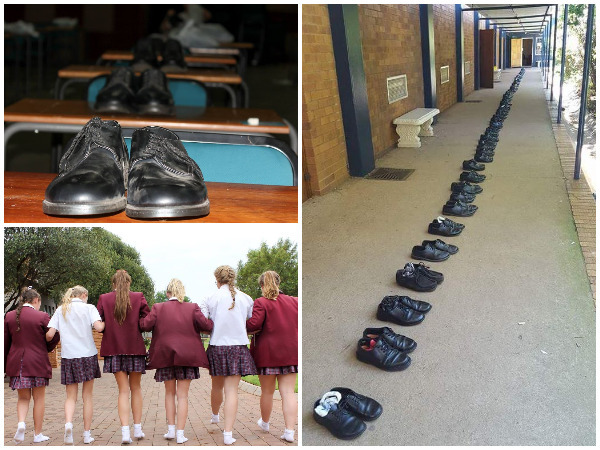 This served as a symbol of the ‘big shoes’ they left behind to be filled by the present learners of Hoërskool Ben Viljoen as well as future learners,” the school explained on its Facebook page.